It’s April, ya’ll, so time to get your summer ORGANIZED. I know it’s hard, I know you’re busy, I know you just want to catch up on sleep. But: it’s April. During each Alley Play Makers 2-week session, campers join their peers for a full rotation of group activities designed to help even the most timid child find the confidence to step onto the stage. The young actors will learn the basics of theatre skills, including: what it means to work as an ensemble; how to create and live in a character; how to make and stick to bold choices; spatial awareness and creative movement; how to tell a story with the voice and the body; and how to create a beginning, middle, and end of a story. Alley Master Teaching Artists guide fun and informative lessons and each Alley Play Makers session ends with an Open Workshop, which allows a glimpse into the camp classroom. There are now 3 locations: downtown Houston, Fort Bend, and Spring. 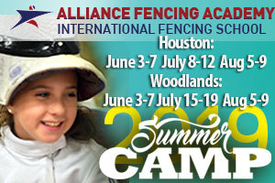 The fencing camps offered by Alliance Fencing Academy are an incredible opportunity for your child to have tremendous amounts of fun while learning skills that will last them a lifetime. Renowned instructor Andrey Geva and his highly trained coaching staff provide a fun and exciting setting for kids to learn the fascinating sport of competitive fencing. Their relaxed and comfortable setting ensures your child will grow and mature through peer interaction and validation. Camps take place in Houston and The Woodlands. Unmask your child’s creativity this summer in the all-new Camp Invention® program, Supercharged™, where children build confidence, learn to collaborate, and transform their wild imaginations into epic creations. 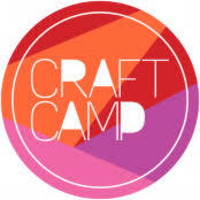 Campers in grades K-6 will learn creative problem-solving skills while coding and programming futuristic robots, uncovering ancient fossils, designing high-tech superhero gadgets and exploring radio frequencies. Local educators will lead this action-packed program. 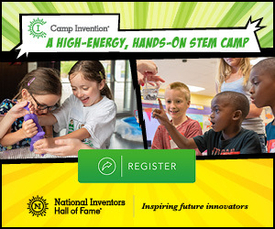 Visit www.invent.org/camp or call 800-968-4332 to register. Use promo code PLAY15LISTING to save $15 (expires 5/10/19). EARLY/LATE CARE AND SCHOLARSHIPS ARE AVAILABLE DEPENDING ON THE LOCATION. Register your kids for these fun-filled week-long camps that explore the natural world through active, hands-on indoor and outdoor adventures at this 155-acre nature sanctuary. Please note that some camps are sold out but if you’d like to get on the waiting list, register as usual and your name will be added. Topics for 2019 include: “Stayin’ Alive,” in which kids learn about a snake with a snorkel, a blood-squirting lizard, an acting bird, and a roly-poly mammal; “Arboretum Underground,” in which kids will learn about fungi, insects, and anything that burrows, sleeps, or lives underground; and “Wetlands, Wet & Wild,” an action-packed camp exploring the wild world of wetlands with hands-on learning, fun games, and creative crafts. A summer of education and adventure awaits your child at HMNS. The perfect camp choice for your future scientist, Summer Camps at HMNS feature hands-on activities against the backdrop of a world-class museum to inspire fun, active learning. These week-long science camps for kids ages 6–12 are taught by world-class teachers, so your kid will experience real science in action. 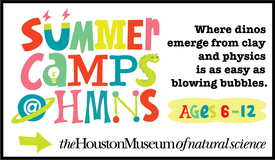 HMNS members get to take advantage of summer camp discounts, and there’s never been a better time to become a member! Use promo code SG19 to save up to $50 OFF a museum membership, which you can purchase here. This special discount goes extinct August 31st so don’t wait! 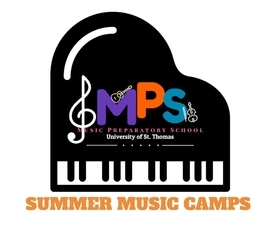 Every summer, the University of St. Thomas Music Preparatory School offers children's music day camps for K-12 -- the ages vary depending on each camp. Kids can learn piano, guitar, percussion, math and music, choir, and organ -- as well as strings in the Axiom Summer Music Academy which includes lessons from members of the Axiom String Quartet. These top-ranked music programs allow students to participate in daily classes, ensemble and student performances, and concerts. Camps are led by professional musicians and instructors with extensive experience teaching in summer music programs, workshops, and private settings. All camps take place on the University’s campus.